On Thursday night, May 28, a slender crescent moon will be bracketed by two bright star clusters: M44 (the Beehive) and M67 (King Cobra). This month, new moon was on Sunday, May 24. By Thursday evening the moon will be five days old, and the lunar crescent will have broadened to be 27 percent illuminated. This is bright enough to be easily seen, but not so bright as to dim objects nearby. And two beautiful open star clusters are nearby. On Thursday evening, May 28, the moon can serve as a guide to help you find these two objects, which you might not otherwise notice. Most stars start their lives as part of a star cluster. When a "star factory" like the Orion Nebula completes its job, the pressure of the newborn stars' light blows away the gas and dust, leaving behind a cluster of young stars. Such clusters, known as galactic clusters because of their location in the plane of the galaxy, are found all around us. In fact our sun is a member of a loose association of stars which includes five of the Big Dipper's stars. Such clusters can have up to about a few hundred stars, and are very different from globular clusters, which are found in a halo outside the galaxy and consist of hundreds of thousands of very old stars. Although Cancer is famous as one of the 12 constellations which make up the zodiac, it is a singularly inconspicuous constellation. In fact, it is the only constellation which contains a deep sky object brighter than any of the stars in the constellation. That is one of our targets for Thursday night, the Beehive Cluster, number 44 in Messier's catalog of deep sky objects. Messier 44, also known as the Beehive or Praesepe (Latin for manger) Cluster, is one of the largest and brightest star clusters in the sky. It is located 600 light-years from the sun, is 16 light-years in diameter, and is 700 million years old, a youngster on the galactic time scale. To the naked eye, it appears as a faint glow In the middle of Cancer, but is often overlooked because Cancer itself is really hard to find because of the dimness of its stars. 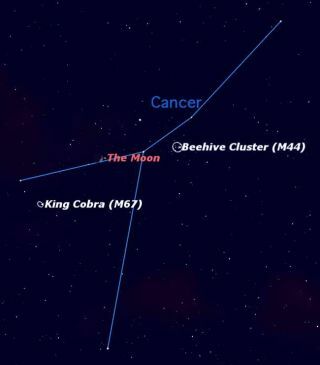 On Thursday night we will use the moon as a way to locate both Cancer and the Beehive. If you download this chart you can readily locate two star clusters, one on either side of the slender crescent of the moon. With binoculars, the Beehive is a spectacular sight. It actually looks better in binoculars than in a telescope, because its large size overflows the field of view of most telescopes. The other star cluster in Cancer, Messier 67, is a more difficult target. Sometimes known as the King Cobra Cluster, M67 is fainter and smaller than M44. It is also much older: at 4 billion years of age, it is one of the oldest known open clusters. It is five times more distant, 3000 light years away. Very faint in binoculars, this cluster comes into its own in a small telescope. So, Thursday night, get out there with your binoculars, and have a look at two of the prettiest star clusters in the sky!